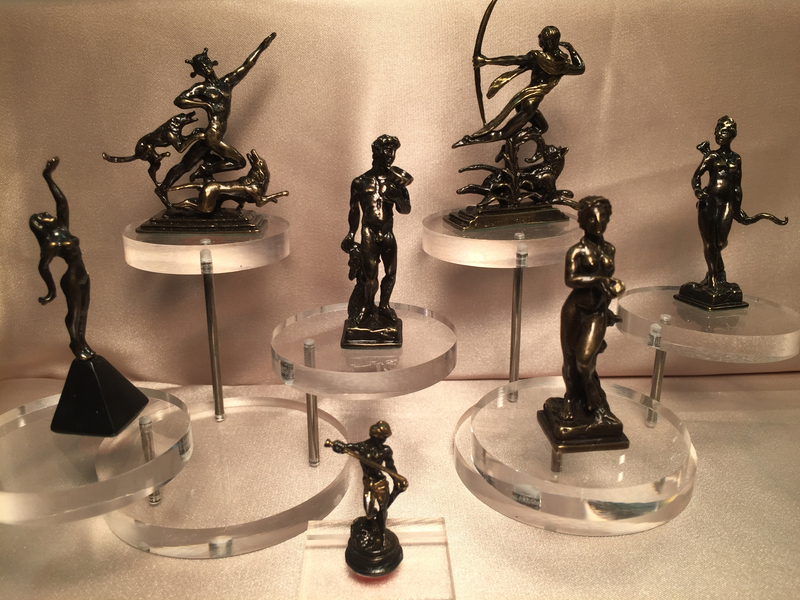 Each one of these amazing bronzes have been artfully recreated by Mr. Addotta. On the top left, we see Actaeon a hero of Greek Mythology, On the top right, Diana, Goddess of the Woods. 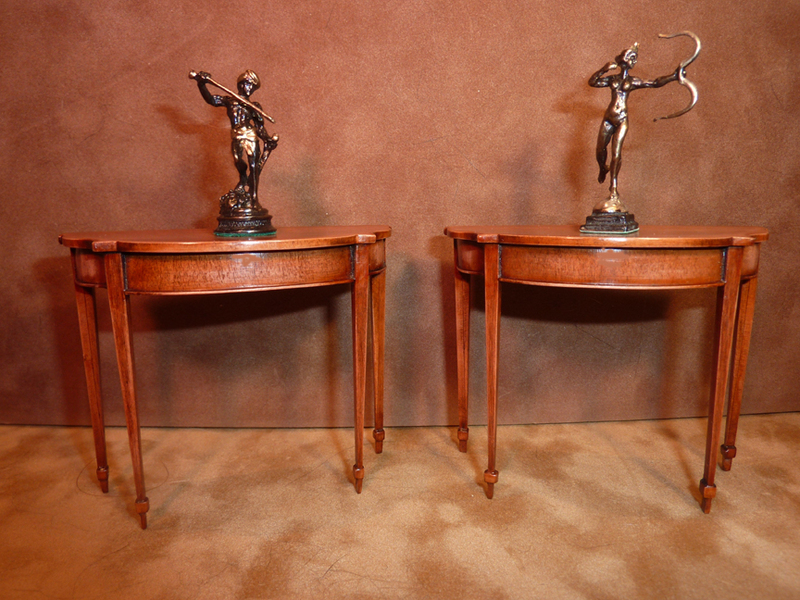 Both Actaeon and Diana are paired together in Greek Myths. In the center mid level is Bacchus, the roman God of Wine. To the right of him is the Goddess Diana. On the far left is the Dancing Faun of Roman roots, The right front is the lovely Greek Goddess, Venus. Completing the diorama is the biblical David in the front. Please click on picture to enjoy enlarge photo and really see the pictorial designs. 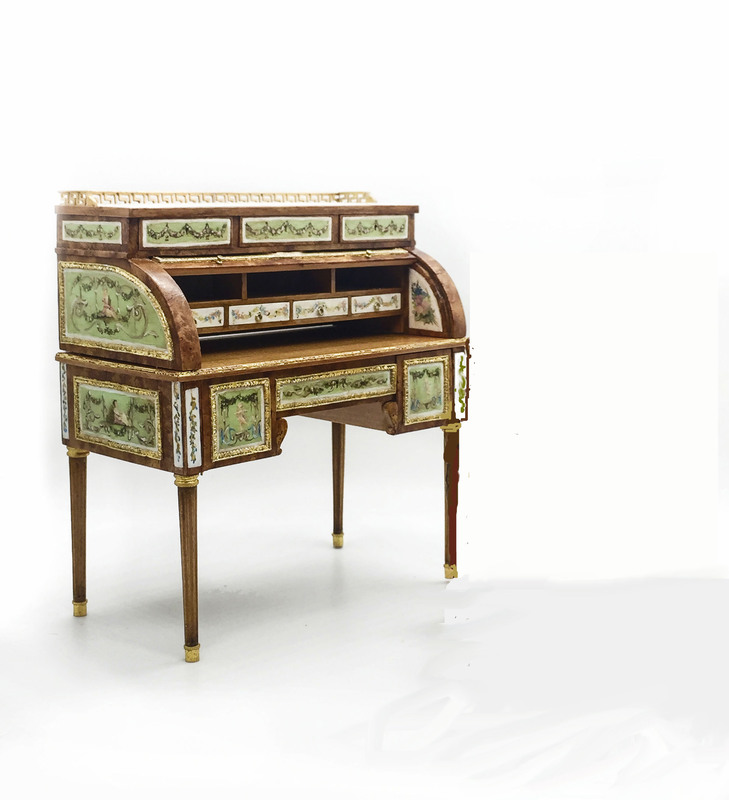 This handsome and highly important Scagliola marble and ormolu enriched sideboard and its accompanying pedestals attributed to S. Jamar is exactly the type of work demanded by wealthy and important clients to decorate their houses. It draws its inspiration from the classical world, with numerous motifs making reference to poetry, literature and to learning, but also from France and the grandeur of Louis Quatorze's court at Versailles. 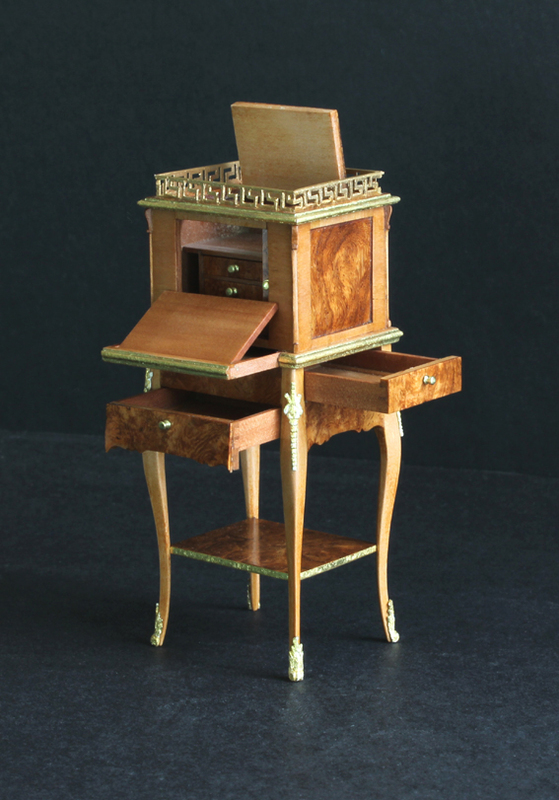 In particular, its robust architecture corresponds to that of a pillar-fronted bookcase bearing the brand of S. Jamar, who traded as a 'French cabinet maker' in London's Wardour Street and claimed in 1818 that much of his furniture, bronze-enriched in the French manner, was 'equal to any made in Paris.' English, Circa 1810. Piece is 8 inches is length. 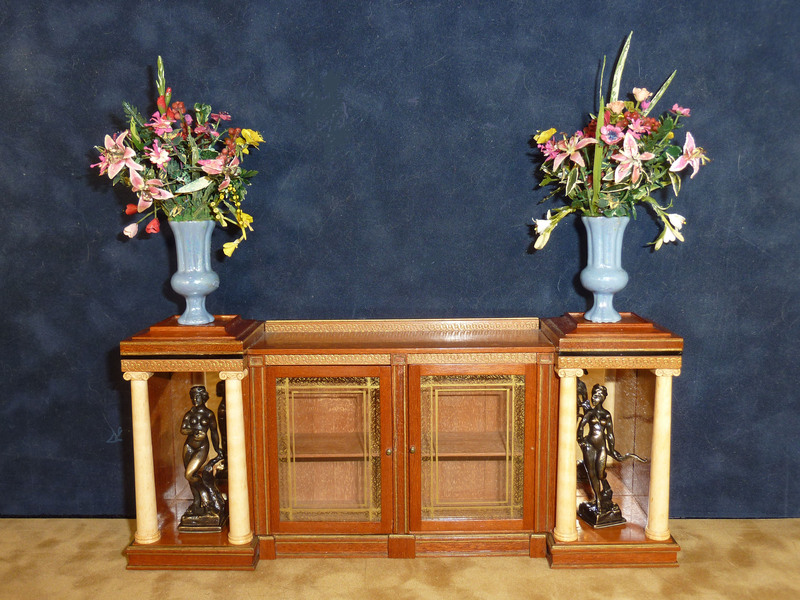 Flowers are by Marty Stark and statuettes are by Joe Addotta. Please click on picture to enjoy enlarge photo. This is truly a unique piece. It's made primarily from amboyna, but has kingwood and fruitwood inlays. 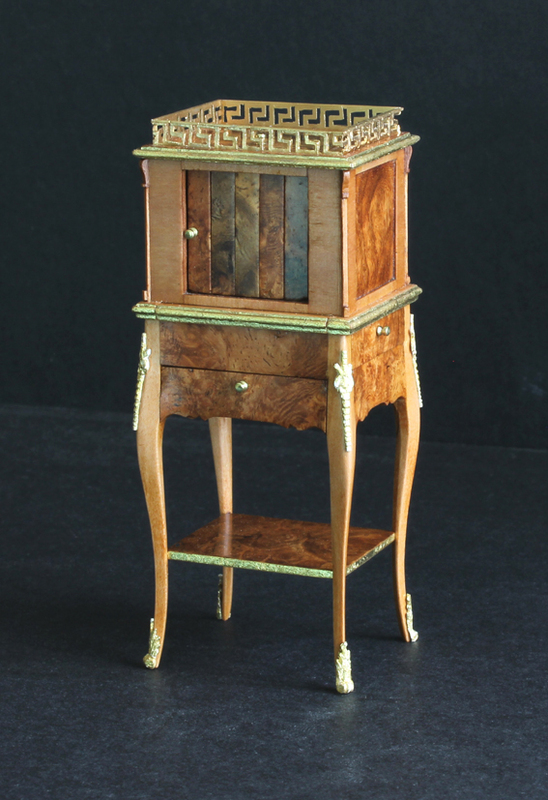 About 5.5 inches, this Regency pedestal sideboard/desk is an extremely versatile piece. The front has false drawers which open from the top on both sides so that is can be used as storage bins, such as, in a dining room. Yet there is a sliding drawer and storage selves on each side so that it could be used as desk. Please click on the image for an enlarged version. 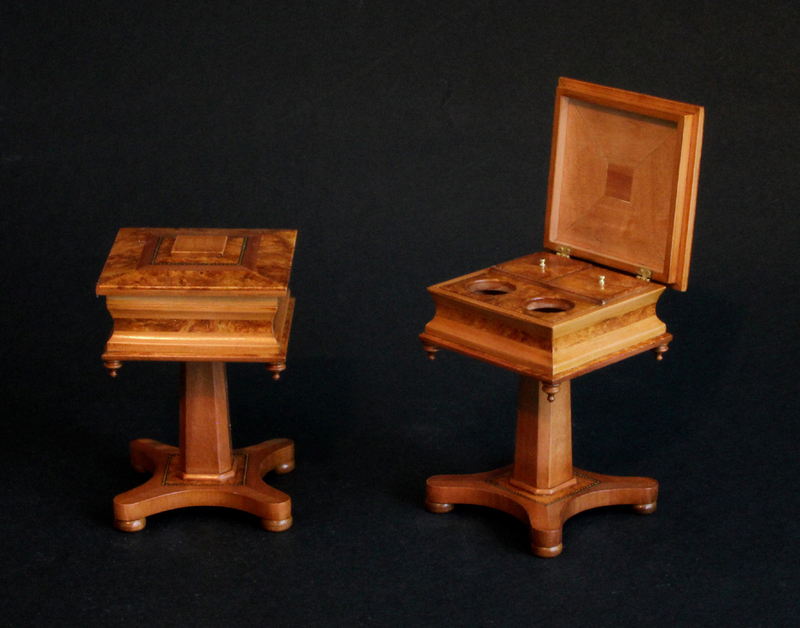 These are beautifully done gueridons or wine tables made of amboyna. 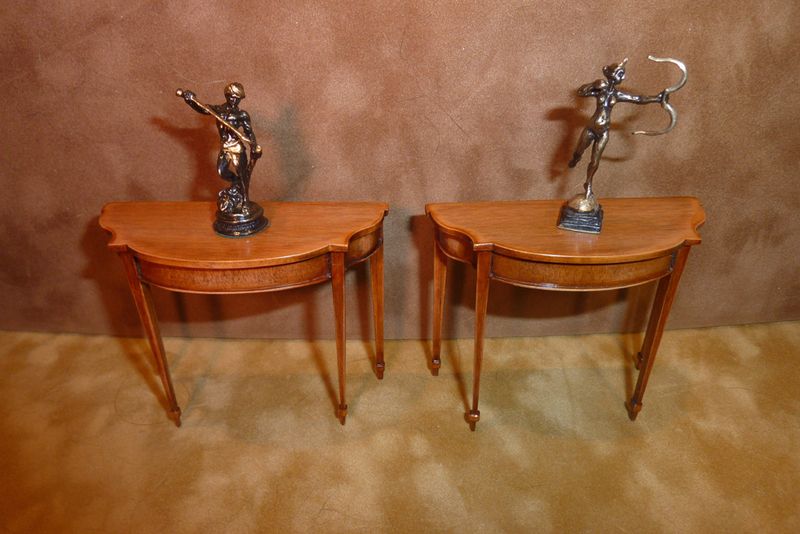 The tables have a carved brass ormalu on the two shelves bottom and is on casters. 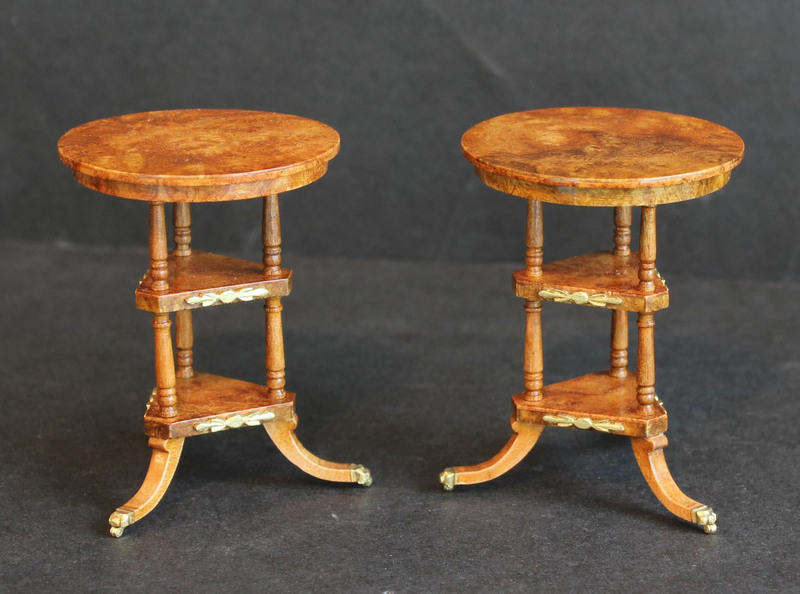 The net result has been the creation of a "unique" version of the tables with its roots in the Regency Period, but with French motifs. Thus, giving it a universal applicability to a wide range of uses. Please click on picture to enjoy an enlarged version. 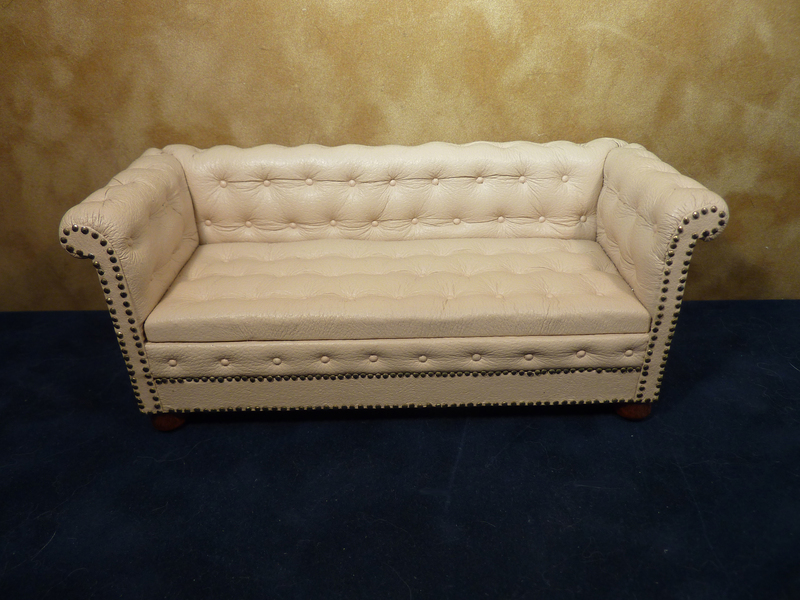 This serpentine demi lune goes anywhere and in any time period. 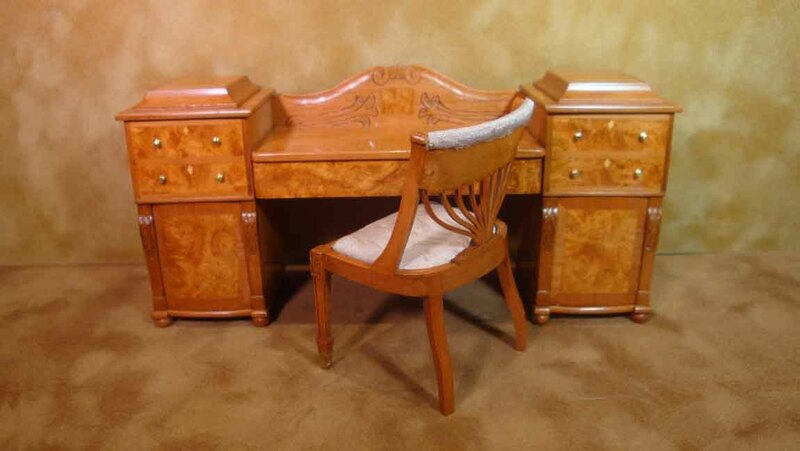 It is satinwood with a light colored finish and is truly timeless. These Joseph Addotta brass pieces of David originally sculptured by Antonin Mercie in 1870 and Diana of the Hunt are outstanding pieces. Please click on picture to enlarge photo. ONE TABLE LEFT. The Dulcimer has its origins in both Spanish Europe and the Middle East. It was the forerunner of the guitar and banjo in the America. The name dulcimer come from the Latin and Greek meaning free standing instrument like the Sitar. Dulce and Melos are found in Samuel's works, which when combined means "sweet tune." 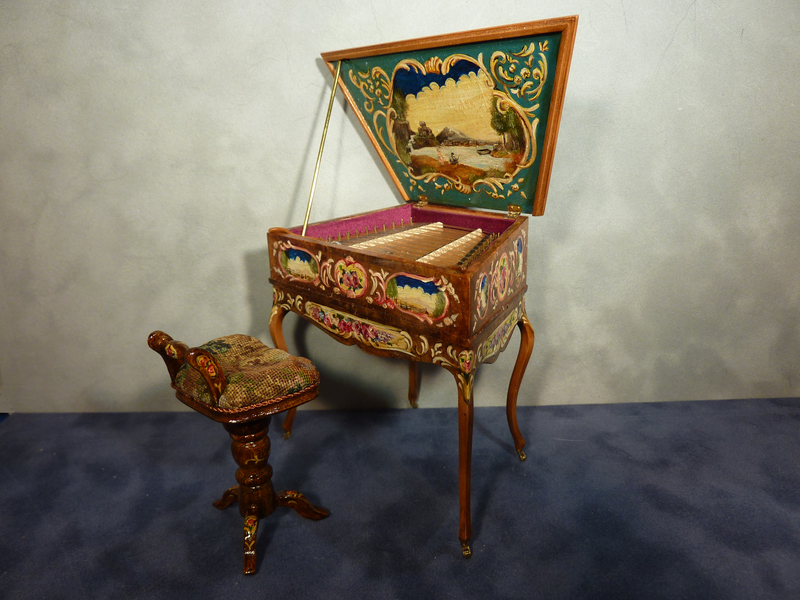 When the dulcimer's stringed keyboard was adapted to the Pianoforte, which offered a more dynamic musical range, it ultimately eclipsed the Dulcimer's popularity. This was especially true among the aristocrats of the early 1800's. In Taylor Colleridge's poem in 1816, "Kubla Khan," he refers to "a damsel with a dulcimer. 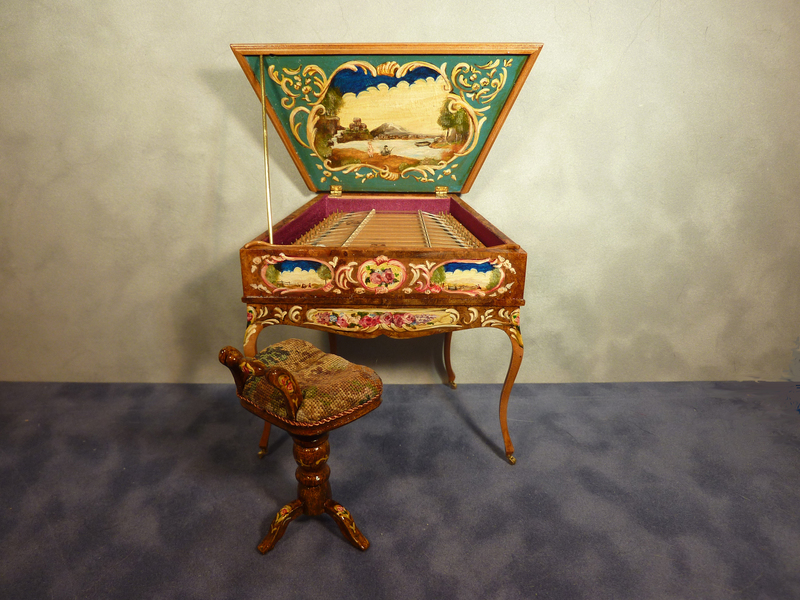 Napoleon's Josephine gave recitals using the Dulcimer. This was a combined effort of Mark and June, who did all the wonderful painting. Please click on the picture to enjoy an even closer view. 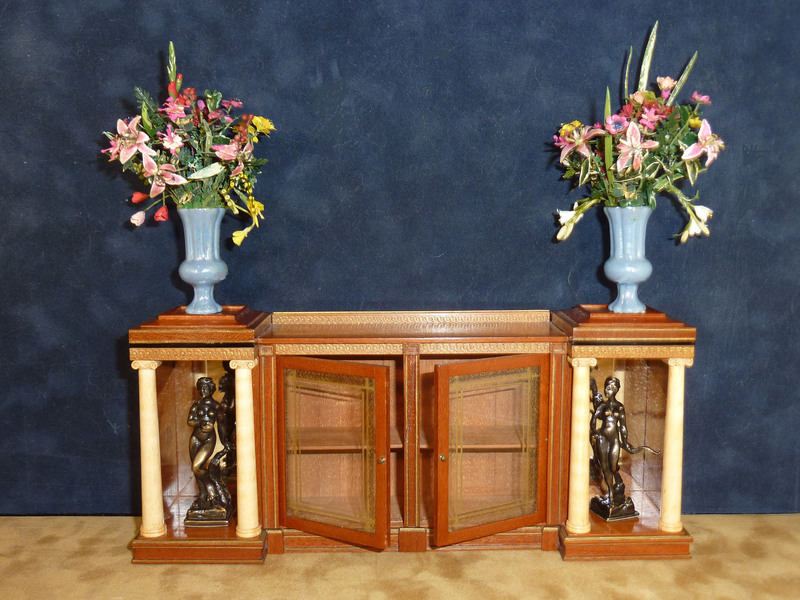 SOLD, ONLY SIMILAR PIECES CAN BE ORDERED AS EACH ONE IS A UNIQUE PIECE. 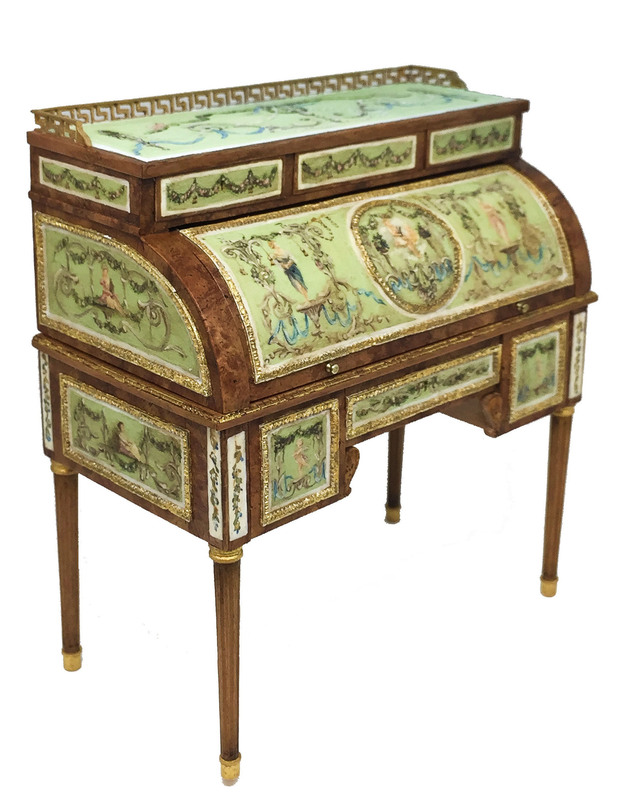 This is a gilt-bronze mounted and painted Louis XVI roll-top desk attributed to Claude-Charles Saunier. It is decorated with garlands and bouquets of flowers on a green and white background. Apollo is the central figure, flanked by the allegories of Abundance and Temperance and the sides represent the four seasons. When rolled up, the desk has eight small storage drawers. The lower part has a centered drawer and two on each side. They are dove-tailed as well. 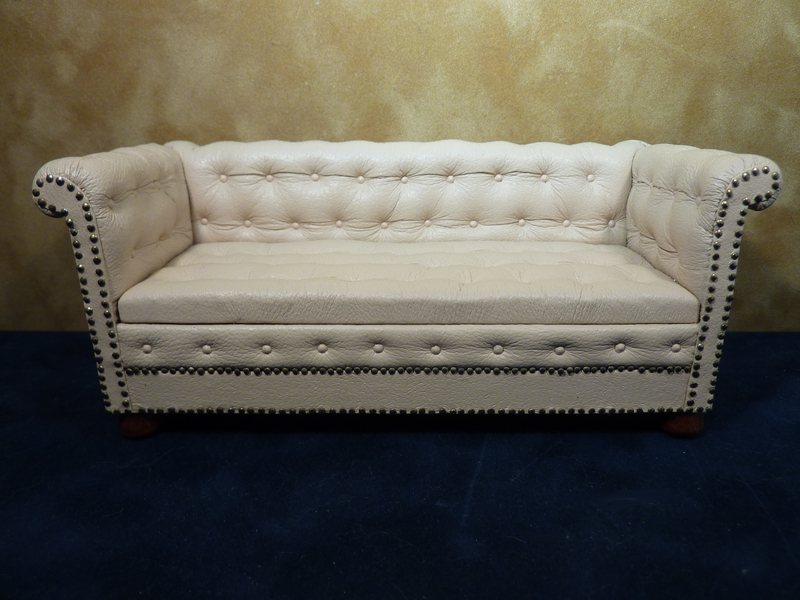 A brass railing enhances the top of the piece. I know my description might be boring, but here's the interesting part. 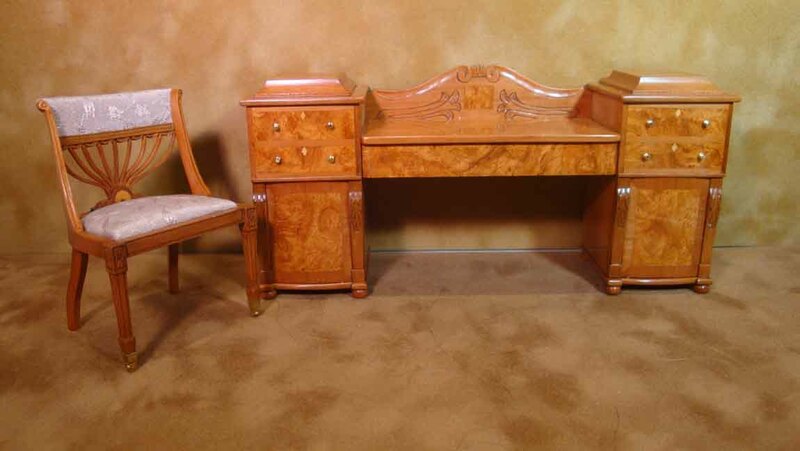 This desk seemed to have been used by Marie Antoinette, though it has not been validated. Please click on picture to enlarge photo.